Hi everyone and happy Monday! Rather than my typical MIMM post talking about my weekend (which can be summarized into resting and binge-watching Netflix), I'll be completing the Versatile Blogger Survey! Thanks to Amanda for tagging me! Check out Michele's blog today- I'm guest posting while she's on vacation! I'll be sharing what NOT to do while marathon training. Go show her some love! I was in the marching band at Penn State, and got to go to four different bowl games (two in Florida, one in Texas, and one in California). My freshman year, we went to the Rose Bowl, which was an amazing experience! We marched in the parade, played at Disney World and stayed at a hotel right by City Walk. It was such a great experience, even if we got crushed by USC. George Bush- my dad's work had a picnic and he stopped by. Heath Miller- He was signing autographs at a mall, and a friend who worked for a local news website got to go. He is HUGE and was really shy and reserved. Ed Hardy clothes, blue eyeshadow, platform shoes. 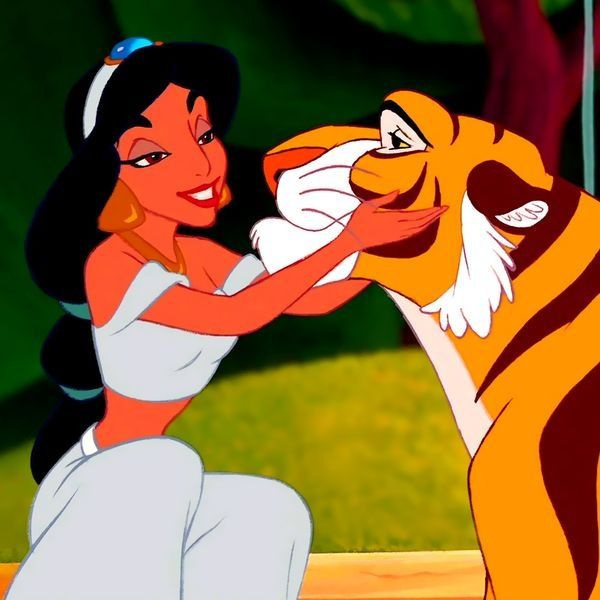 Jasmine, mainly because she's voiced by Lea Salonga and has Rajah! How Do I Live for a slow song and Sweet Caroline for a faster song (especially if I'm doing karaoke at Penn State! I'm convinced there's nothing Dan can't do..
People at work who sing, whistle, talk loudly on the phone (while it's on speaker) and clip their nails. That's all things that my cubical neighbor does. Yay. Grey shirts. Any time I find a shirt I like, I always end up buying the grey color. It just looks so good with everything! Now it's your turn to answer some of the questions! If you're a blogger, I tag you to do the survey next! Blue eye shadow... gag. With you there! And your cube neighbor sounds like I would die if I were you! Ahh yes!! Those are definitely in the top as well. Thanks for the support Jamie!! Spain is on my bucket list. I'd love to go and eat and drink my way through the country, like I did with Italy. That would be awesome! I've been to a few different cities and regions in Spain and would HIGHLY recommend visiting the island of Mallorca. SO beautiful and the food/wine/everything is delicious! Hahaha I had to endure nail clipping the other day and I couldn't tell if I was more annoyed, or more shocked, that someone was actually doing that in the office! Same here! It shocks me and disgusts me every time. Who does that!! Your co-worker clips her nails AT WORK? In PUBLIC?!? WHAT IS WRONG WITH HER. That is horrific. What a bad, bad person. Ugh I'd die. I would totally go in a rage haze if someone did that next to me! I love all your answers. It's a cool way to get to know you a bit more! I had to laugh at #9! I am also a huge fan of grey clothes. I have grey everything! It's the best!! Plus every grey looks different..so it's not technically all the same..right? Your cubicle night sounds like a horrible person - anyone who doesn't use common sense on things like what's accepted in public is a horrible person in my mind. I worked next to someone once who was a very heavy smoker and would hack stuff up next to me all day, making me gag. Ugh that's so bad! I think we can all agree that cube neighbors aren't always the best. I hope I'm not annoying to anyone! I'm totally with you on the nail clipping! It drives me crazy, and I always want to ask the person if they have a home to do that at. I have entirely too much grey in my wardrobe as well. It's pretty much entirely grey and blue. Grey does look so good with everything, I agree. Haha I should do that! I'm way too timid to say something..I wish I was more ballsy to stand up and say STOP NOW! That is pretty much amazing that you were in Penn State's marching band. I went to Virginia Tech and was very close to joining their marching band... but I ultimately did not to give up the freedom in my schedule for band practices. It sounds like you had some great traveling opportunities with the band! OH my goodness with the Ed Hardy clothes.. I couldn't stand that! I'm also with you on the nail clipping. I don't even understand why people do this in public. Maybe I'm just really skeeved out by it but I think it's one of those things that should be done in private or at the nail salon. Ick. And lol on the Grey shirts... I have a lot of those myself. If it comes in grey/silver/charcoal/whatever that neutral hue is then I will choose that! Completely agree with you! And neutrals are always a safe bet :) I can never have enough!